On 5/22/04 - 6/6/04, my buddy Brian Beach and I (Brian Wilson) went on a motorcycle tour of Europe. We went with the same tour guide we have used before, which is Rob Beach with Beaches Motorcycle Adventures. Rob "Beach" is no relation to "Brian Beach". For pictures of some previous tours, click here for 2001 Europe Motorcycle Tour and click here for 1999 Europe Motorcycle Tour. Calling this a "tour" gives you the wrong impression. This IS NOT a long string of motorcycles where you "follow the leader". Here is how this works: you pay one fixed fee (about $4,500) which includes two weeks of motorcycle rental, all the hotels, all you can eat breakfast and dinner, and REALLY detailed maps, all included in the one set fee. Usually "one tour" is about 20 motorcycle riders. The hotels are pre-booked for you in a big circle through 6 countries, the first night outside of Munich, then the next night in Austria, then the next night in Italy, and so on (see the map immediately below). Each morning you get up whenever you like (everybody leaves at different times), have a WONDERFUL breakfast, and then pull out your own map, hop on your own motorcycle, and find your own independent way to the next hotel in the next country (a spiral bound tour book always suggest 2 or 3 extremely beautiful and scenic routes, but you are totally free to do as you want). All your luggage is hauled by a van to the next hotel each night and is ready and waiting in your room when you arrive! This means you can take as much stuff as you like, you are not limited by the size of the motorcycle saddle bags!! All day long you drive the motorcycle through beautiful mountain passes, European alps roads, and it is motorcycle fun, fun, fun all day long. When you arrive into the hotel you go to your room, take a quick shower, then go down to the hotel bar and have a beer. Dinner is in that same hotel (the hotels have been carefully chosen to have EXCELLENT food) and you sit with the rest of the Americans that are along on the "tour" and swap stories about how great your day was. Then off to bed, and tomorrow it starts all over again. If you have any problems during the day (for example, a flat tire), you can always call the van's cell phone and mechanic that travels in the van will come and fix your problem right up and get you back on the road. I have been on 3 of these tours now (tour1, tour2, and now this tour) all with Rob Beach (owner of the Beaches Motorcycle Adventures), and it involves NO PLANNING other than just calling Rob up and booking it. No hassles, no figuring out what hotels to stay at. If you ride a motorcycle, you *MUST* do this as least once in your life, and it's SO EASY why not do it this summer?! See the picture below to get an idea of the route (there are several different routes to choose from, this happens to be the "Alpine East" one that we went on). Question: What does the $4,500 cover and not cover? Answer: It covers motorcycle rental, all you can eat breakfast and dinner, detailed maps, all of the hotels for the whole time you are in Europe. However, you pay out of your own pocket for your plane ticket to Munich, and you pay for the gas you put into the motorcycle (this is for simplicity, it doesn't add up to very much money), and if you choose to drink alcohol at dinner that is extra. You are also on your own for lunches. Question: How do I get from the airport in Munich to the first hotel? Answer: A member of the tour staff will meet you in the van and shuttle you to the first hotel where you spend at least 24 hours "hanging out" and getting over jet lag. Then you get your motorcycle and can play around for another day in the Munich before the tour really hits the road. Question: What if I damage the motorcycle, how much am I liable for? Answer: A few of the motorcycles inevitably have some very minor damage by the end of the tour, like the saddle bags get scratched if the person renting it let it fall over in a parking lot because they were unfamiliar with the BMW's kickstand. Rob (the head honcho) works with a local BMW dealership in Munich to repair such things, and always gets a very good and reasonable price on repairs. I have NEVER heard any complaints from my fellow tour members. And in the end, your costs are capped to some fixed amount like $1,000 if you completely destroy the $15,000 BMW motorcycle. Question: Are the people on the tour all Americans, or are they German and Italian also? Answer: Essentially this is a tour for Americans, but you will meet the occasional New Zealander or Australian or England native. I've been on 3 tours and never had any true German or Italians on the tour with me. Question: I don't speak German, or any foreign languages, will that be a problem? Answer: No problem! Personally, I do not speak any language other than English. First of all, the hotels all EXPECT you to only speak English, so breakfast, dinner, all interactions inside the hotel are very relaxed and in English. While you are out "at large" in Europe, 99 percent of the Europeans you encounter will know EXACTLY what you are (a friendly American motorcycle tourist) and with a smile and a little charades you can really go a long way. You have to understand why-> Europe is very small, and yet they speak so many languages, they do not have the same expectations as we have in America that a visitor speak the language. Sure, I still get a little embarrassed when I'm sitting in Croatia and I don't speak the local "Croatian Dialect", but it really is not a big deal. The Europeans are used to it-> very few German visitors speak Italian, and fewer Italians speak German, and the same for the French, etc. The fact is Europeans are just more relaxed about this than Americans. Question: What Motorcycle riding experience is needed? Answer: I feel you should have at least a year of motorcycle riding under your belt before going. But it varies per person. I have been on the tour with people who did not have that much experience, but they took it slow and reasonable and had a fabulous time. If you happen to go with a group, it is more important that you are willing to drive the same speed as the rest of that particular group. Personally, I happen to be a conservative rider and I am willing to putt-putt-putt all day long. But some people show up to drive motorcycles fast on the excellent European Alpine roads. If you miss-match riders in a small group and somebody feels pushed past their comfortable limits it can be bad. Question: How many miles apart are the hotels (how far do I have to ride each day)? Answer: Most of the hotels are only about 1 or 2 hours drive apart on the major 4 and 8 lane highways. However, the little curvy mountain pass roads are MUCH longer at a much slower speed. On a typical day you might drive the motorcycle 3 - 5 continuous hours, but then stop for lunch and site-see it can stretch out into 6 or even 8 hours from hotel to hotel. Something interesting is that every 3rd night you stay in the same hotel for two nights in a row to give you an optional break and to do some site-seeing if you like. Question: How unbelievably fun is this? Answer: It really, REALLY is as much fun as it sounds. It boggles my mind that more motorcycle riders don't take this opportunity to tour Europe this way. Hint #1: This is NOT a famous city tour or art tour, do NOT try to force it to be one! 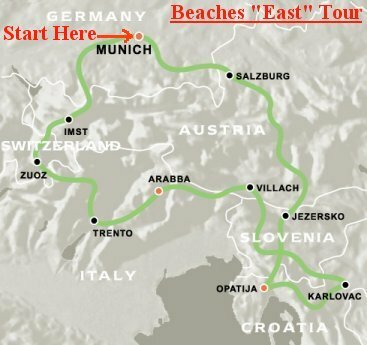 Most first time European motorcycle tour members (myself included) make the mistake of thinking the motorcycle is a way to get between famous cities in Europe, just like the train or bus was the last time they visited Europe. The mistake here is that your days are already COMPLETELY FULL experiencing the wonderful sensation of riding the motorcycle on the most beautiful, fun roads in the world through the country and mountains. You will stop and enjoy the mountain views from the top of the summits, and stop and enjoy wonderful meals and nice cappuccinos in remote villages. But the routes specifically avoid large cities where the European art galleries are (big cities have traffic and thus are no fun for motorcycles). If you try to ALSO do the big city tour and art tour on the same trip, your head will explode, you will not get any sleep, you will have a very very bad time. Just relax and ride motorcycles on this one trip, and on your NEXT trip come back and ride the train and visit art galleries. Each night after dinner GO TO BED and try to get a good night's sleep so that you are well rested for the next day. Hint #2: Riding motorcycles can be stressful and tiring, try to relax! Graham Beker is a mechanic and one of the tour guides that works with the tour group, and one night he pointed this out to me. People come on the tour and have fun, but they are sleeping in a different bed each night, and riding motorcycles all day on roads they are not familiar with, and they get tired and their nerves fray a little. On the 3 tours I have been on, inevitably around the 7th or 8th day I start to hear the married couples squabbling over dinner, or friends get an argument. I think it sneaks up on people because they think the fun means they are relaxed and well rested. It helps to be aware this WILL happen so you can take a few deep breaths and not yell at your loved ones along on the trip. Hint #4: Drive your bike the way *YOU* feel comfortable, let others drive theirs! If the group you are with starts passing trucks on blind corners and you do not feel comfortable with it, then for goodness sake stop riding with them and slow down and be safe and have a good time. And at the same time, it is probably a bad idea to try to convince them to slow down-> they are making their own decisions and they can deal with the consequences. Either put the slowest rider in front and be happy, or happily split up and meet back up at the hotel for a beer at the end of the day. Just be happy, and don't force groups of different preferences to stay together, it leads to arguments, frayed nerves, and general unhappiness. Hint #5: Every individual *MUST* be self sufficient! This is related to Hint #4 above. In case riders are accidentally separated, each rider must be completely self sufficient so that you can relax and meet up again at the next hotel. This means that each rider *must* carry their own passport so they can cross borders. And each rider *must* be able to navigate in the unlikely situation they get separated and are all alone. And each rider *must* have the address of the hotels and the cell number of the tour guide. You would be amazed how many times people unintentionally get separated, it is very easy. For example, the first rider stops at the gift shop at the top of the mountain for a bathroom break thinking this is totally obvious, and the second and third riders just two corners behind don't notice because the first rider has pulled off into a group of 10 other motorcyclists! Together one second earlier, the next time you see each other is dinnertime. Hint #6: Bring a radio, and a cell phone. FRS radios have a 2 mile range and are about $20 each, and most cell phones now work in Europe. As soon as you get separated STOP, try to communicate by radio or cell phone. These are pretty useful tools. Some riders also like radios that have headsets that integrate with their helmets so they can chat while traveling down the road. It isn't a bad idea. Hint #7: Bring a GPS! 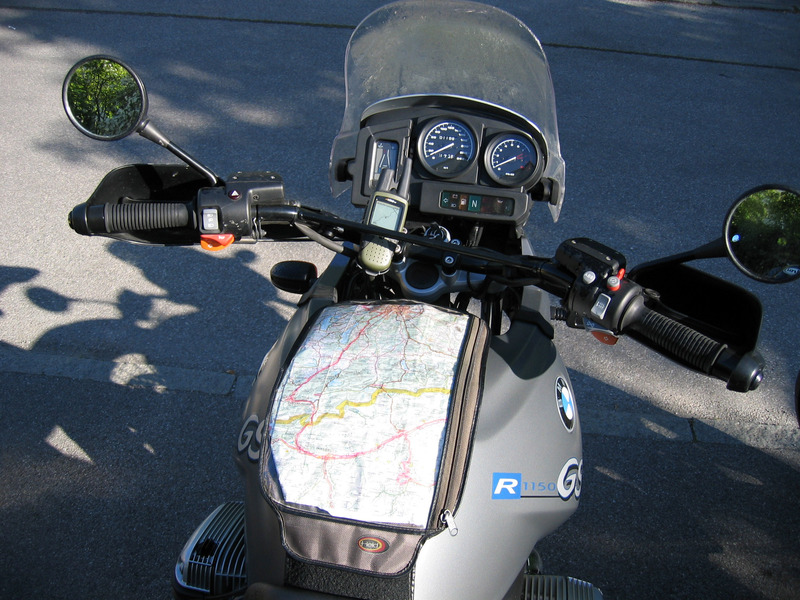 Click here to see a picture of my $99 Garmin Rino combination GPS and FRS Radio mounted on the handlebards of my BMW motorcycle while on tour. On this tour, about 1/3 of the guests on the tour brought GPS units, I expect it to be even higher next time I go. GPS units are cheap, and are unbelievably wonderful to keep you from getting too lost, get one, you won't regret it. Ten years ago we used to stand by the side of the road laughing and VERY lost trying to decipher a map, and it would take hours to backtrack and fix mistakes. Now we still take the occasional wrong turn, but it becomes clearer sooner. Hint #8: Bring enough clothes so you will not have to do laundry, but do not overpack! Rob Beach says on his website you will do laundry in your sink at night, but almost nobody does. Bring enough clothing so you don't have to do laundry. But don't over do it, in a pinch if something terrible happens you can do the sink thing, and there are two places along the tour (one in Arabba, Italy) that have clothes washers. But the washers are very slow, and you don't want to waste a night in Europe doing laundry. Most people end up over packing. This isn't for you, my dear reader, but for me. :-) I hate forgetting some small thing (sunglasses, or a travel alarm, etc) so here is a list I keep so I can check it before I go. But maybe you can glean something useful from it. Water bottle - nice to keep a little water with you at all times on the motorbike. Highlighter Pens - to mark your current day's route on the Rob Beach supplied maps (faster to read on a moving motorcycle). powerbars - get caught out too late? Take a break, drink a little water, eat a powerbar, you might have hours before dinner. Caffeine pills - add these to #4 when you are REALLY REALLY caught out too late. No reason to lose focus, and it's not easy to find an open Starbucks Coffee at 9pm at the top of a random mountain in the Dolomites. ATM Card and Visa and cash - no more need in Europe for any traveler's checks, just hit an ATM. i18n Drivers License - silly, not really a legal document, can be bought for $10 at any AAA. But helps smooth over problems with local police. Camera, (remember the charger) - ski-epic has got to be fed! Tinted AND Clear Visor for Motorcycle Helmet - I like having two, Rob Beach recommends just a clear visor and sunglasses but I prefer the tinted visor. Totes & Totes Removal Tool - "Totes" are great, they are cheap rubber over boots that will keep your feet totally dry in a downpour. The "Removal Tool" I refer to is a 10 inch long 1/2 inch diameter PVC pipe I bring to help get the wet Totes off my motorcycle boots (buy for $1 at any hardware store). I slide the pipe down along the back of my leg down to my heel then "pry" and they come off quickly. Glasses Case - I wear contacts on the motorcycle, it is nice to have a hard protective case for my glasses so they don't get scratched in the luggage during the day when I'm not wearing them. Spare Contacts, Contact Fluid - enough disposable contacts to not worry about losing one or two. Garbage bags - 3 or 4 white kitchen garbage bags for dirty laundry, and for water proofing a torn rainsuit (see next item).